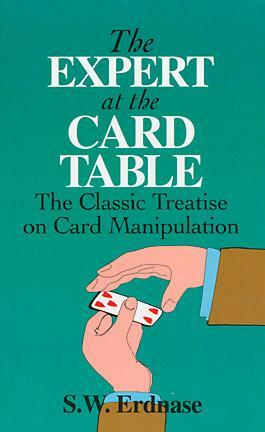 "The Expert at the Card Table is the most famous, the most carefully studied book ever published on the art of manipulating cards at gaming tables." —from the Foreword by Martin Gardner. For almost a century, this book has been considered indispensable to attaining the highest level of card mastery. In it, S. W. Erdnase, a supreme master of card manipulation, teaches card enthusiasts how to perform the dazzling tricks and sleights — many of them his own creations — that made him famous. The first section of the book deals with card table artifice, or, to put it more bluntly, cheating at cards. Step by step, Mr. Erdnase demonstrates his own systems of false shuffling, false riffling and cutting, dealing from the bottom, and such slick moves as palming cards, "skinning the hand" — even three-card monte. The second section covers legerdemain: the art of forcing a card, one- and two-hand transformations, the devious "slide" and more. Card handlers will love Erdnase's selection of dazzling card tricks, including The Acrobatic Jacks, The Exclusive Coterie, The Divining Rod, The Invisible Flights, A Mind Reading Trick, and many others. Reprint of the S. W. Erdnase, 1902 edition.